Almost by definition if it’s there to be celebrated it’s worth doing well, and nowhere hosts a celebration quite like Linden house. 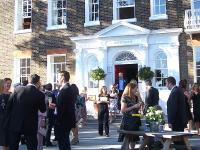 We are the anniversary party venue in West London that people return to again and again. Whether you’re celebrating a birthday, a christening, a wedding anniversary, or holding a party just for the fun of it, we have the perfect combination of private rooms, beautifully prepared food, fine wines and our own well-stocked bar. You are also free to use our outside space with its wonderful views overlooking the river. This makes us an ideal Christening party venue in West London too as the river creates the perfect backdrop for photographs that will form lifelong memories. As a Birthday party venue in West London Linden House really comes into our own. We can lay on the right style of music or entertainment to suit the venue and the mood. Nothing is too much trouble and our friendly staff are on hand to make sure that your celebration is one you and your guests will remember for a long time to come. Don’t worry if you’re daunted by all the options, our organiser has lots of ideas of what you can do to make your celebration a stand-out occasion. See our location and directions, menu options, room layouts & photos, prices & room capacities and terms and conditions.